The online vintage shop takes each traditional component of the modern shopping scene and tosses it on its head. Shoppers don't pick up an item and bring it to a checkout counter. Users comment their zip code below a photo of an item to purchase it and receive an invoice within the hour. Browsers don't comb through a stack of mass-produced product in search of their size. 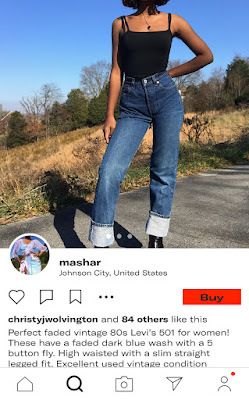 They see a photo of a pair of 1970s jeans while scrolling through their Instagram feed--a one-of-a-kind item in one size only, for one time only. More and more women are building businesses by selling vintage or thrifted clothing on online platforms like Instagram and Depop, and more and more women who want unique clothing are following and buying, creating a market for thrift store treasures that were once someone else's rejects. 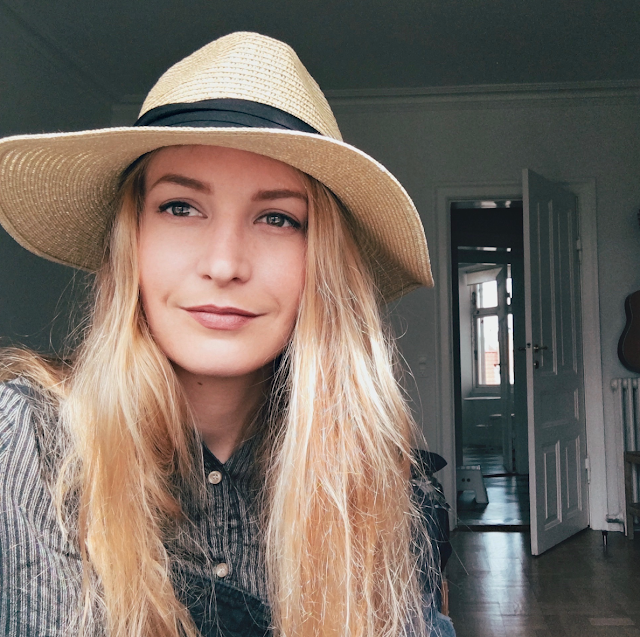 Below are transcripts of my conversations with three such women about their online shops, the appeal of vintage, and their digital business models. What were you doing before selling vintage, and how did it lead you to found your shop? I studied biology and chemistry in college and I was preparing to go to become a pharmacist. I worked at a pharmacy after I graduated undergrad, and it was not what I wanted to do for 40 hours a week. I worked there for a couple years, just to make money, not because I actually enjoyed it. I was kind of just throwing darts at a map--I was applying to random jobs in random places, and zookeeping in New Orleans found me. I was like, "What can I do with a biology degree that's not working in a lab?" and I love animals. I really didn't consider that hanging out with animals all day meant cleaning cages and picking up poop for a full time job. It was like having a dog x50. While I was in New Orleans, I didn't know anyone, so I just spent my time going to local thrift stores. I'd always find all these random pieces I really liked, but they didn't fit me because I'm a size 16 and they only just recently started making nice clothes for plus-size people. All the cute vintage clothes are always, like, size 4. I wanted to have all these beautiful things, but I personally couldn't put them to use. My boyfriend was like, "Hello, you're finding all these wonderful things that you have access to, and you should just sell them to people who trust your curation and judgement." 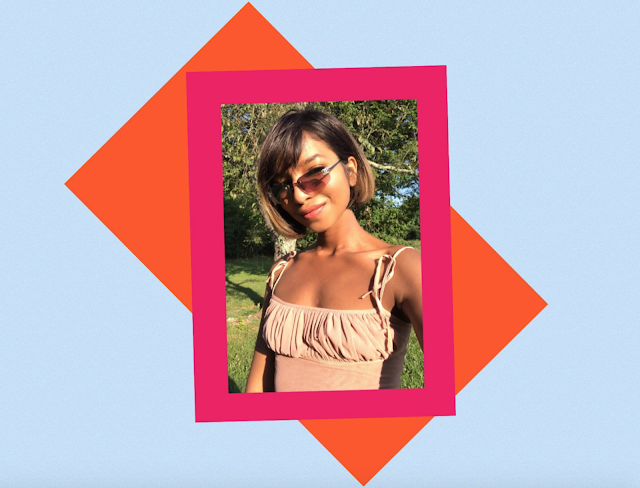 I started the store when I was living in New Orleans because my job there was over--I didn't want to be a zookeeper anymore--and now I'm back in D.C.! Story behind the store's name? "Maganda Pa" means "still beautiful" in Tagalog (I'm Filipino, and Tagalog is one of the languages in the Philippines). It kind of has a double meaning. 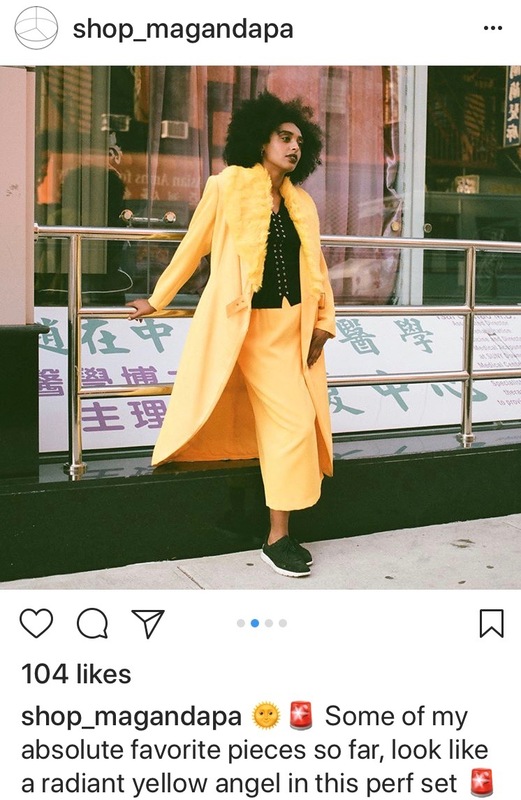 I started the store out of frustration with the fashion industry and the fact that I saw no representation of women of color. I was upset about the exclusion of this huge group of people who were not able to relate to many models or shop owners. So, "Maganda Pa" meaning "still beautiful" is saying that, despite not feeling represented or visible in fashion, there is a space for you in what I've created. Even though it's just a small digital space, it is still here and you are still beautiful and you are still welcome here. The other meaning is that...these are secondhand pieces, and despite being unwanted by their previous owners, they are still relevant and still beautiful, and here I am presenting them. Running an online business is different from manning a brick-and-mortar shop. Positives of this? Negatives? I think that with any small business there are definitely a lot of downsides, but it's the upsides that count because you're pushing your vision and this dream that you have that you want to make prosper. The upsides are that I've met really cool people. On social media, I'm interacting with people's personal accounts and I have an easier way of connecting with people because I can talk to them directly. Also, I'm at the whim of Instagram, a platform I have no control over. With their new algorithms, it's taken a weird turn on business. 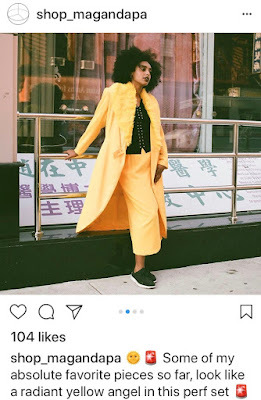 Trying to navigate those hurdles is a different set of challenges being an Instagram business, but there are challenges with every method of going about things. Has there ever been a piece that you intended to sell but fell in love with and kept for yourself? That has definitely happened a few times, in which case I just have to part with it and let it go, because I don't even go out that much to places where I would be able to wear these beautiful pieces. There was this one purse that I loved--it was covered in Mother of Pearl tiles and had tortoise shell lucite handles. It was so stunning. I died when I had to send that off, but it went to a good home in Europe. There was this other purse that was this insane vintage 1950s Japanese fishing basket/purse...I also died when I let that go. Why are vintage sellers blowing up right now? 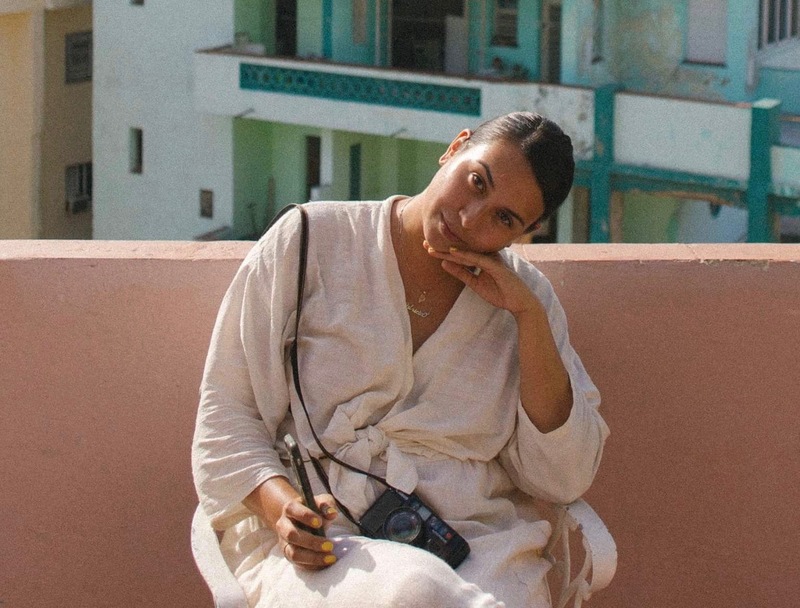 What place does vintage have in the fashion industry? Going to a thrift store and having to sift through everything yourself--that's definitely fun, but it's a different experience. We've already done the service of finding them and curating them with these other pieces to give it a different understanding than if you just saw it randomly by itself amongst a bunch of junk. 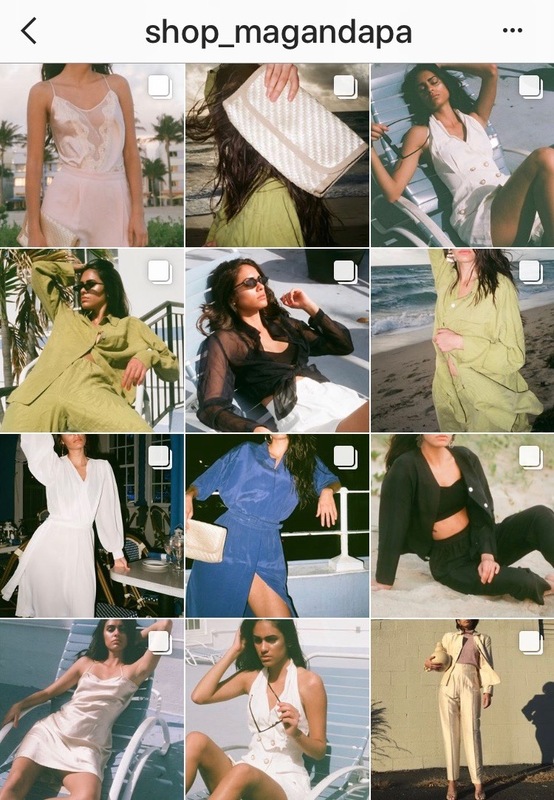 I definitely think vintage has more of a spotlight right now because there's a focus on self-love, self-care, and individual expression, and you can really express yourself with these pieces that are one-of-a-kind that nobody else is going to have. These are the pieces that styles now are based on--these are the original ones. Everything is so cyclical, so it's cool to feel ahead of it and have the original thing. 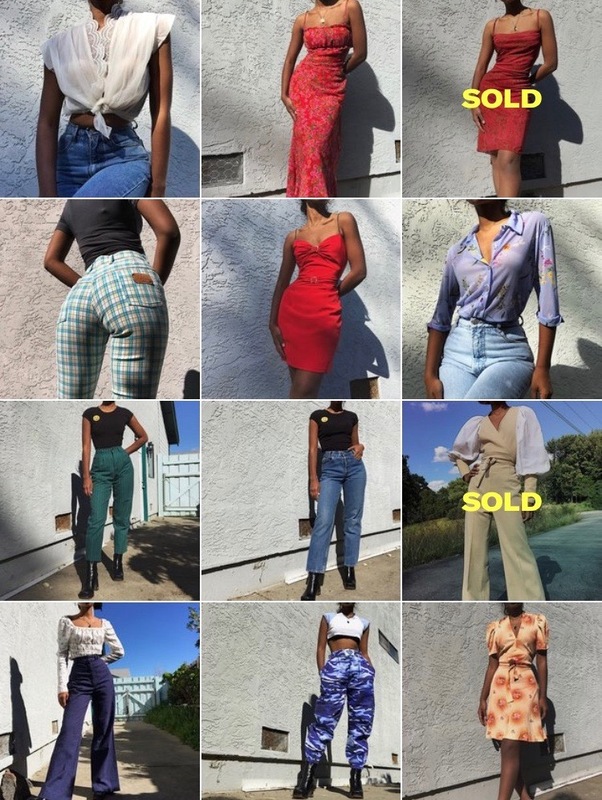 How has selling vintage been fulfilling for you? It's nice because it has been an actualization of my own interests and passions. It's cool in that regard and it's nice to be able to talk to people all the time and entire this community of people and getting to know people that I originally wouldn't have reached. It's been cool to enter this universal network of people with similar interests and styles who are just out here supporting each other doing cool stuff. Go-to piece from your shop for a night out? This yellow suit I had was so crazy, but it was the best outfit ever. 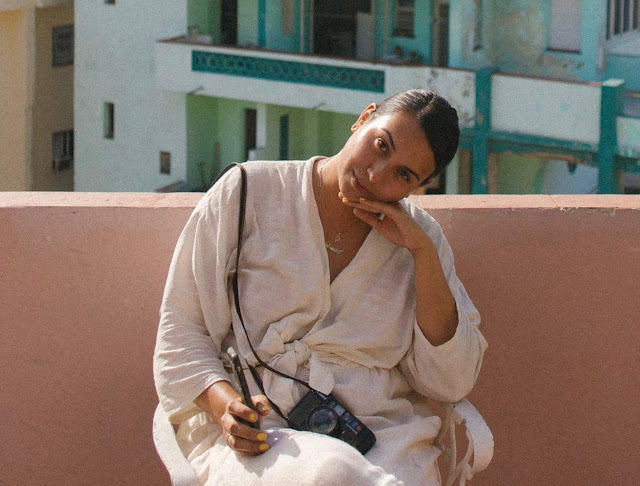 I grew up in Bangladesh, and it was mostly the manufacturing environment there that influenced my relationship with fashion and vintage. Fast fashion companies have their stock manufactured in places like Bangladesh because of the low labor costs, and it's just not humane at all. The factories didn't have any air conditioning and health insurance didn't--doesn't--exist there. There were mountains of rejects, clothes that had little defects, like one stitch out of place. My dad brought back home whatever samples and factory defects he could find, and my whole family wore those clothes. We never really bought new clothes. Growing up in a Muslim family, I was the odd one out--at 17, I married my husband John, who is Catholic and American, after we met on this website called Vampire Freaks. We lived in North Carolina for a while, saving money to move to New York, and I thrifted a lot there because the malls didn't appeal to me. In Bangladesh, if you're not getting factory rejects, you make your own clothes. They weave their own saris in the villages, and in the city they buy fabric and take it to a tailor. The quality of everything (in Bangladesh) felt better, and I didn't like the mass-produced product in the malls. I collected a crazy amount of clothing and I decided that I'd try to sell it, because not only did I look at pre-80s clothing as an investment, but I also loved the thrill of finding the right item. After I gave birth to my son, it felt like I was doing nothing. Not that being a mom would be anything bad, but I’ve just always felt like I’ve been preparing myself for something big--I wanted my son to be proud of me and inspired by me. I’ve just come so far and done so much, and all of a sudden everything stops and I’m just sitting in my house, and it felt wrong, sort of. I wanted something for myself and myself only. I found this, and this is my thing. How often do you buy stock for the store? Any favorite places? My favorite places are antique fairs anywhere, suppliers, and lots of estate sales. Estate sales are mostly dug, so you have to know the right people or dig out advertisements. And check newspapers! I once went to an antique fair at 5 a.m. and we had to basically run and try to find the best thing before anyone else did. There's lots of sellers like us. This job, if you want to do it seriously, will make you broke. It will give you so much anxiety, because if you don't have the right stock, the money isn't going to be there. Positives: I don't have to show up at work, pay rent, pay a mortgage, or pay additional utilities. That's amazing. Cons are sizing struggles, which arise because all vintage fits differently and I don't have a physical store for people to try things on in. Everyone's body is different, so the proportions (of the piece) might be confusing to someone. If the customer doesn't know how to measure themselves or their size (I get it, it confuses me sometimes, too), the piece may not fit them like they expected, and I'm afraid of letting people down in that way. Also, a lot of people who have not bought vintage before or are new to the scene will expect something to to feel and look like it's new, so I could feel more secure if customers could just touch it and see it in person to decide if they like it enough. 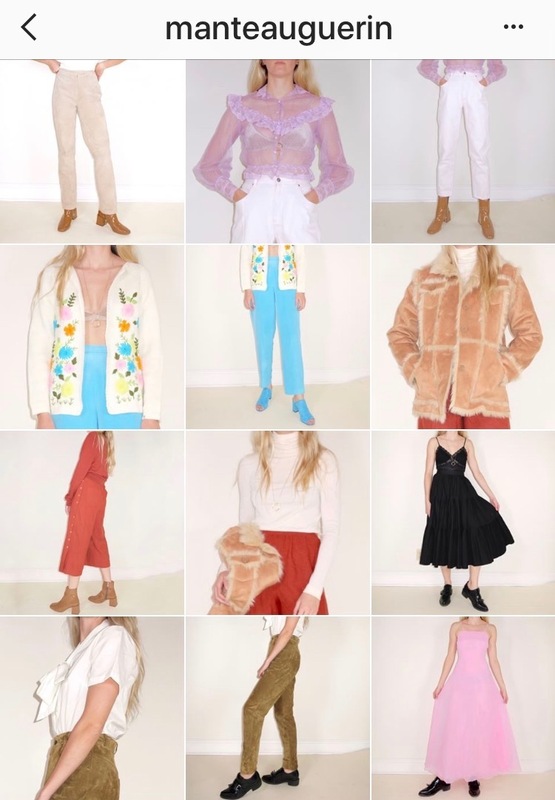 Why are vintage sellers blowing up right now? What place do you think vintage has in the fashion industry? The feeling of wanting something unique is always going to exist, I think. That has existed in me forever. It's just--some people are not brave enough to be individual or go with what they really want. Everyone feels that, you, me, everyone wants to be unique and wear what they love. It's also the quality. You want a sturdy pair of pants that mold to your figure every time you wash them, and it's going to practically last you--maybe even your kids and grandkids--forever. I'm making people happy--or at least I think I am--which makes me extremely happy. It's an amazing feeling of relief and happiness when I get a good review. I didn't think about the environment at first because I didn't think I could sell enough to make a difference, but I think I am making a tiny bit of difference, so that makes me feel really good. I'm extremely impulsive and I get tired of things really fast--this job is the thing I've stuck to the longest, besides my family. I have this fear that I'm going to die tomorrow, and I don't want to die miserable. If something were to happen to me tomorrow, I would be satisfied--I wouldn't feel like my life is a waste. It would be short, but I would be happy. A pair of well-fitting 501s. I worked in retail throughout my younger years and my college years. People would come into the stores I worked at and spend their entire financial aid check on clothing. At a certain point, I realized that people were buying stuff just to buy stuff. I knew they didn't need to buy the same shirt in every color, but my job was to sell. I was an Environmental Studies major in college, and so many things about the retail atmosphere conflicted with my core values--from the very basics like a store manager refusing to recycle cardboard to receiving items that smelled toxic. I left right when I graduated and found an awesome job working in sustainability in the apparel industry. Through that job I got to meet a bunch of passionate sustainability professionals and work with companies throughout the value chain (brands, retailers, manufacturers, NGO's). I've always felt that it's so important improve supply chain impacts, but I've also always had this nagging feeling that if people could just buy less new sh*t the world would be a lot better off. We throw away SO many clothes every year in the USA--80 pounds per person, every year. There are so many beautiful things that get trashed! It is so wasteful and so wrong and SUCH a big opportunity. I have loved vintage shopping since I was a kid, so when I left my job to start consulting I decided to setup shop on the side. It has been a lot of hard work, but the most fun ever and totally worth all the hard work. Running a brick-and-mortar shop has so much overhead. I don't know if I will ever be interested in fully doing that. Having an online shop means I can set up shop and run it from anywhere. When I started my shop, I was doing it out of my home which meant clothes and photography equipment everywhere. In a tiny SF apartment that gets a little overwhelming, so I eventually made the leap to rent a studio space where I could set up an area for photography, keep my clothes, set up a desk and a shipping station and all that jazz. Having a physical space to work out of that is separate from home has made my business feel much more real. I am going to be launching in-studio shopping appointments soon, which is really exciting for me. I think the hybrid brick-and-mortar model where you take appointments and sell online is great. It allows me to set a schedule that works for me as a small business owner, and not have to pretend I can be omnipresent. That happens every day. I only sell pieces that I love, so if I love something enough to desperately want it for myself, I get it online right away. If I kept those pieces, I wouldn't be leading with my best, and what kind of shop would I be? But it is painful sometimes. Why are vintage sellers blowing up right now? What place do you think vintage has in the fashion industry? I think people are getting sick of having the same clothes as everyone else. Buying a vintage piece feels special, regardless of the price. I believe that people want to stand out and look and feel special. When you purchase a piece that calls to you and you're the only one who can own it, you cherish it. It's a much different feeling than running into a fast fashion store and buying the latest $8 trend. Frankly, I think a lot of consumers are over fast fashion. Times are changing and vintage is thriving at every price point--it's such a fun shift to be part of! 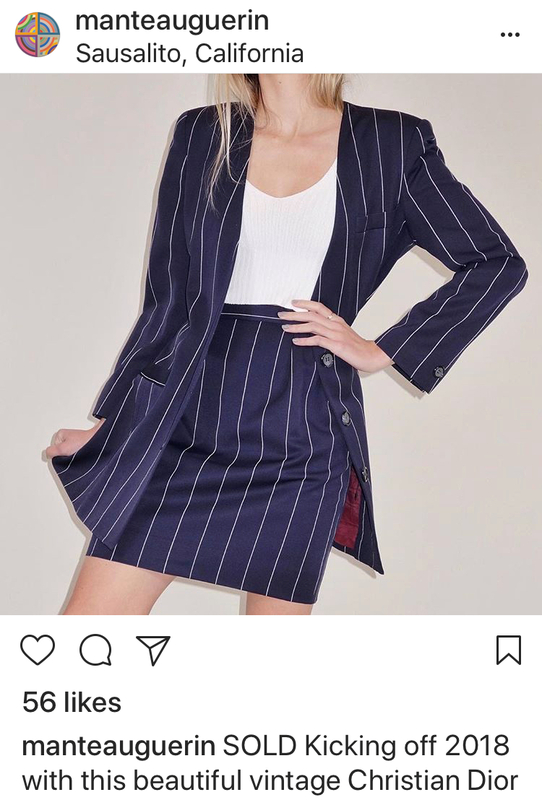 100% this Christian Dior skirt suit. I fell head over heels for it and it was adopted into a very loving new home.